Both the reading and the delicate movement carried out at the time of turning book pages over were Cherif Ghofrane’s inspiration when designing her unique concept-store: Libr’Air. Her project, which was a finalist at the 9th PORCELANOSA Architecture and Interior Design Awards, in the Forward-looking Projects regarding the Students’ category, represented a lively and unique architectural alternative, by combining a library and a bookshop together with a restaurant, without leaving the special area for visually impaired people behind. Satisfying the whole society’s needs was Cherif Ghofrane’s main objective, a student at the College of Design and Audiovisual in Tunisia. In order to carry out this aim, she banked on the integration of various distinctive areas in the heart of the project, such as: the exhibition and sales areas, a free consultation area, an e-book area, a visually-impaired people area, an area for children, a lounge-restaurant and a terrace-bar in ‘the sky’. Every single area is fitted with materials and products from the PORCELANOSA Grupo, which provides its designs with both elegance and quality. In order to develop the project, Cherif Ghofrane took the shape of a book as a reference. A special tribute to the essentially-cultural origin of Libr’Air bearing in mind that the book works as the main idea generator, by conditioning volumes, the arrangement of space and the setting up of different levels and areas. The morpho-structure of the concept-store is based on different open books, which are displayed in juxtaposition in order to create a circular shape. The elimination of visual barriers is highlighted, so that the interior is integrated into the exterior and vice versa. 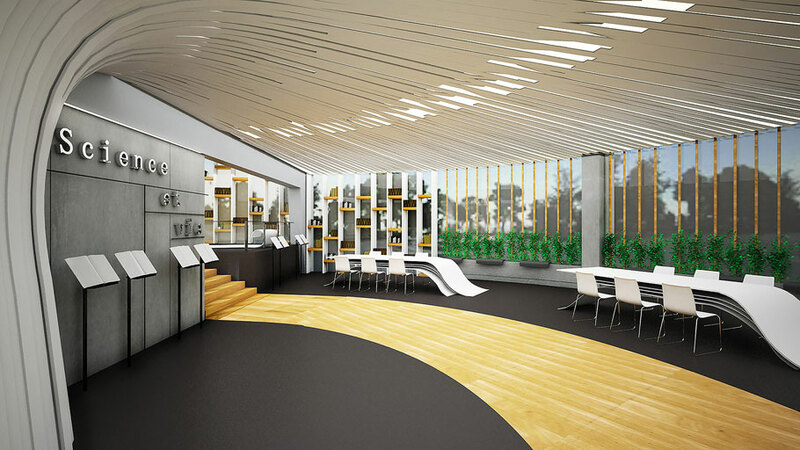 Therefore, Libr’Air may be the ideal project for building in a privileged public environment. The PORCELANOSA Grupo’s mineral compact, KRION® Solid Surface, is a material which plays a very important role in this project because of both its versatility and its thermocurving properties which allow for creating different book-inspiriting volumes and shapes. 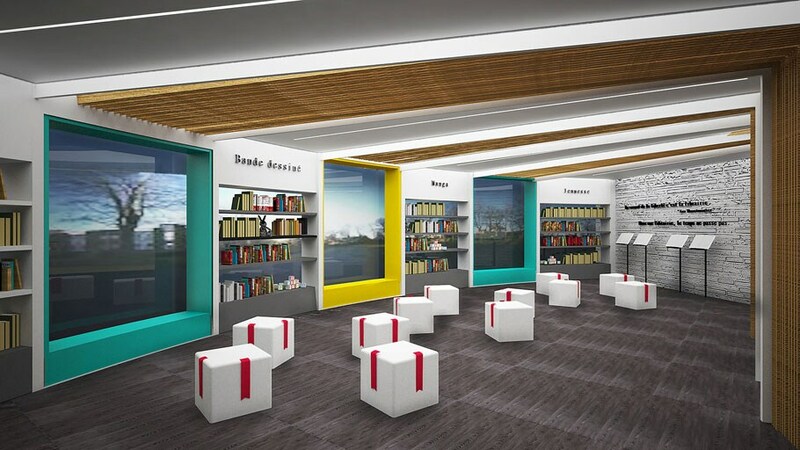 In fact, and in the laminate format, it covers the ceilings of various Libr’Air spaces, such as the reception or the book shop area, both of them manufactured with 1102 Marfil KRION®. The acrylic stone, on the other hand, is present in this project due to materialising the furniture in some areas such as the book shop, the kids’ corner or the sky bar, as well as in the worktops and the reception equipment. With regard to the floor tiles, the high-resistant and long-lasting full through-body porcelain by Urbatek is firmly and clearly banked on, which results in it being ideal for the contract spaces and high-traffic areas. 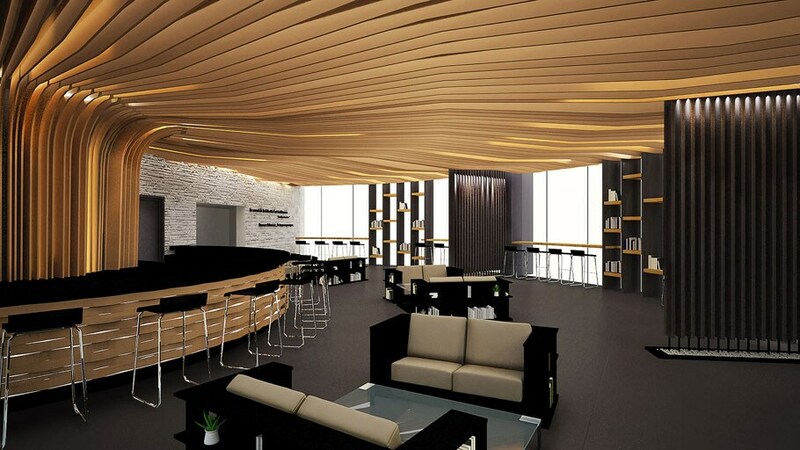 In this regard, one can find really excellent through-body porcelain tile collections, such as the Deep White Nature, at the reception area; or the Town Cosmos Polished in the book shop area and restaurant. 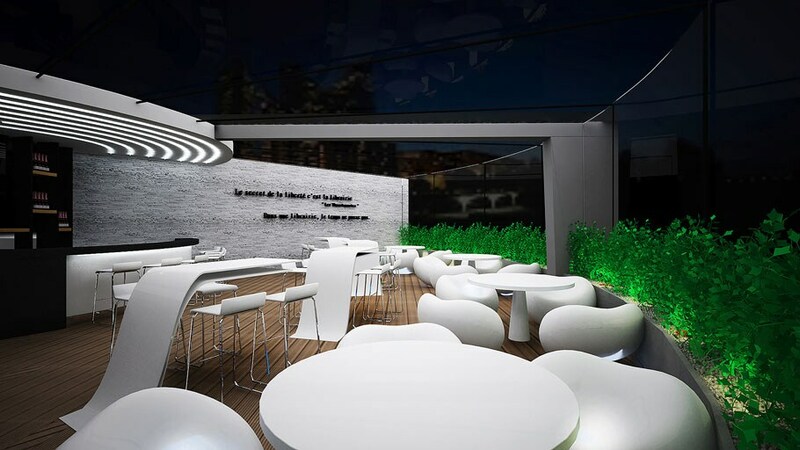 One of the other high-resistant materials used in Libr’Air is the outdoor decking by L’Antic Colonial, the model Styledeck Plus Brown, which is perfect for the sky bar exterior. 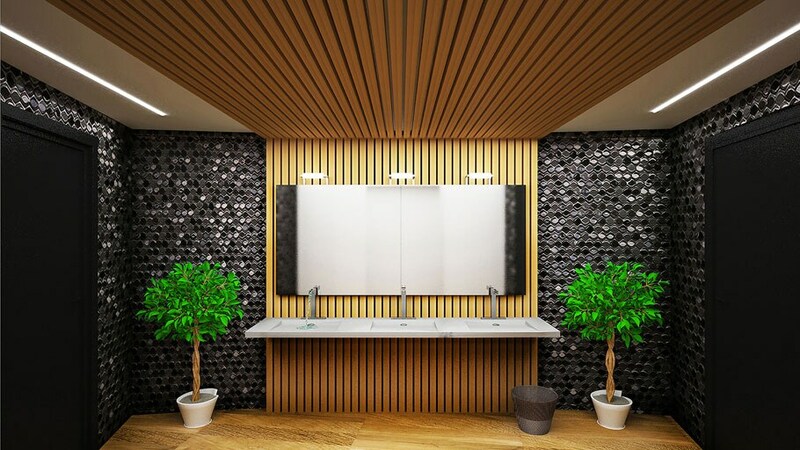 With regard to the wall tiles, on one hand, it is worth highlighting the authenticity of wood in some areas being combined with the avant-garde design by KRION®. Decorated wall tiles are also highlighted, since they provide small places of interest with higher sophistication in the interior design. For instance, at the front of the bathroom, the textured Madison Antracita ceramic wall tile by Porcelanosa has been the choice; whilst on the other hand, the Harmony Strip Silver by L’Antic Colonial is present in the Sky Bar or the area for children. It is a project that brings both culture and modernity together, in other words, a contemporary space which fits in any space, and furthermore, it is suitable for all audiences.